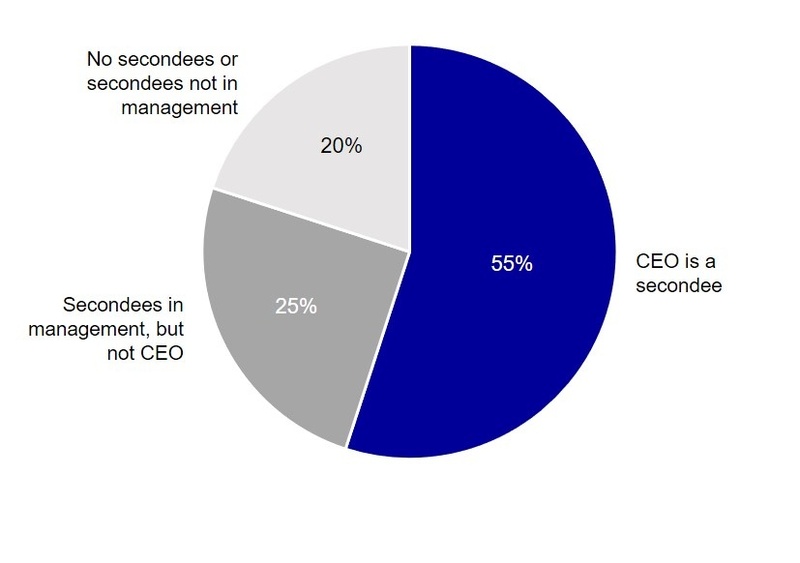 SECONDEES PLAY a key role in many joint ventures: some 80% of joint ventures have secondees in top management roles (e.g., COO, CFO) and 55% have a seconded CEO (Exhibit 1). Parent companies use secondees for various reasons – for instance, to provide critical skills and capabilities, to accelerate initial staffing in experienced roles, or to secure added transparency, assurance, and influence over venture activities. Middle Eastern JV: Secondees from one partner work from 7am to 3pm in the JV and then work at their parent company’s local office from 3pm to 6pm, where they connect with, receive insights from, and provide updates to colleagues and higher-ups. Is this acceptable? South African JV: Secondees from one partner participate in their parent company’s weekly functional leadership calls to share performance data, discuss issues, and review company priorities with their peers working in the parent company’s wholly-owned and operated assets in the region, and to receive guidance from a Regional Vice President. Is this okay? North American JV: Senior secondees from the two main partners lead quarterly business and operational reviews of the venture within their parent company without the explicit knowledge of venture leadership or the board. Is this okay? Central Asian JV: Secondees from several partners share performance data and risk and investment analyses with their parent company to support internal reporting and assurance requirements, but do not share such information with other shareholders of the venture. Is this acceptable? In situations like these, secondees are left to their own devices to navigate the murky waters between loyalty to the parent and the venture itself. Who should a secondee obey if their JV line manager and their supervisor at the parent company give conflicting directives? How should a secondee spend their time if two or more supervisors simultaneously demand their attention? Secondees need clear direction on who they report to and how to interact with their parent company – and to have that memorialized in an agreed role description, and reinforced in conversations and training prior to taking on the role. The first step is to define, at a high-level, the basic reporting relationship that secondees will have to their parent company. Ideally, all secondees in the venture, including those from different parents, will follow the same model. In our experience, there are six basic models (Exhibit 2), with some creating more issues than others. These models array from least to most secondee interdepended with the parent company. For example, on the far left “No Relationship” model, secondees have no reporting relationship to or structured connectivity with their legal employer during their secondment period; they are simply sent into the venture with a pat on the back and fond wishes. This model is fairly rare, and really only seen among smaller and less experienced companies who do not fully appreciate the need to maintain some ongoing connectivity with the parent. Alternatively, and more frequently, secondees have no reporting relationship to the parent, but do have a named “sponsor” in their employer. This sponsor is a first port-of-call to resolve issues, help guide the secondee’s career development, and support repatriation of the secondee following the posting. In other cases, secondees can report to one or more people in the parent, either on a “dotted line” or “solid line” basis. Indeed, we have recently worked on a number of ventures where secondees had multiple dotted-line reporting relationships into their parent – one into their corporate function, and one into the regional business unit. While there are reasons for choosing various models, not all these approaches are created equal. For example, the “No Relationship” model can leave secondees feeling unsupported and disconnected from the parent, while the parent company misses opportunities to learn from and add value to the joint venture. Based on experience working directly on more than 500 JVs across the last 30 years and drawing on more than 25 major research studies on JV governance and performance, Water Street Partners has developed 26 standards of excellence related to how a JV and its owner companies use and manage secondees. These standards are organized into six dimensions (Exhibit 3). Similar to our joint venture governance standards, our secondee standards can be scored to provide a venture and owner companies with strengths and gaps relative to good practice. Jim is a co-founder of Water Street Partners, where he serves a global client base in industries ranging from oil and gas, mining, and chemicals to hi-tech, and industrial manufacturing. He has supported more than 200 joint venture transactions and restructurings, and worked extensively on JV governance, organizational, and commercial issues. Josh Kwicinski is a Senior Director at Water Street Partners, where he serves clients on joint venture transactions and governance issues in the natural resource, industrial, and high tech sectors.